Thank you all for coming by the Ustream show last night. I had a GREAT time and hope you did too. I'm so glad that Mom called into the show and was able to thank you all personally for the many wonderful birthday wishes you gave her. If you weren't around, she so appreciated them! Thank you! Cut paper to 4 x 9-1/4. 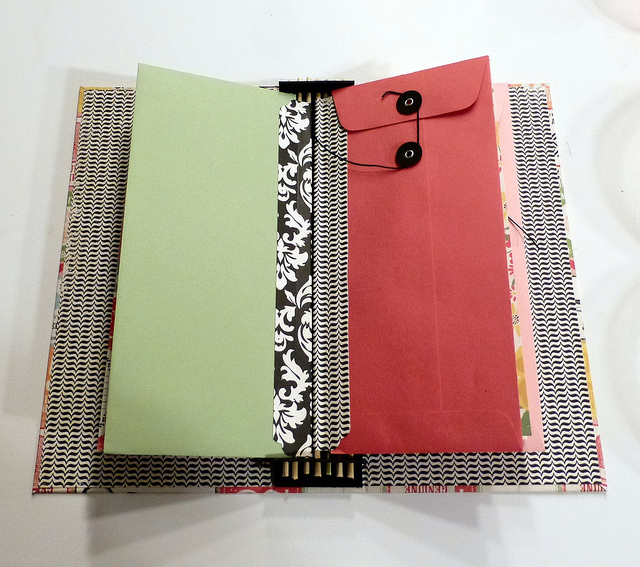 I used both pages and policy envelopes for the pages to this album. That's it gang! Once again, thanks for joining me! Have an awesome, awesome day! Fantastic as usual Cardboard Cowboy! Will watch the video later, you gonna have to do a European special one of these days for the Europeans that got work the next day.....we don't all have heavenlymam's retirement time. After being able to accomplish your mini envelope book, I just might try this. I have been wondering what to do with all those skewers I bought at an estate sale. Thanks for all your hard work and give Mama a big hug for me today! Thanks, that was a fun show. I'm going to have to go back and watch the first part as I came in late and missed how to make the binding pieces! Loving this paper-who is it? 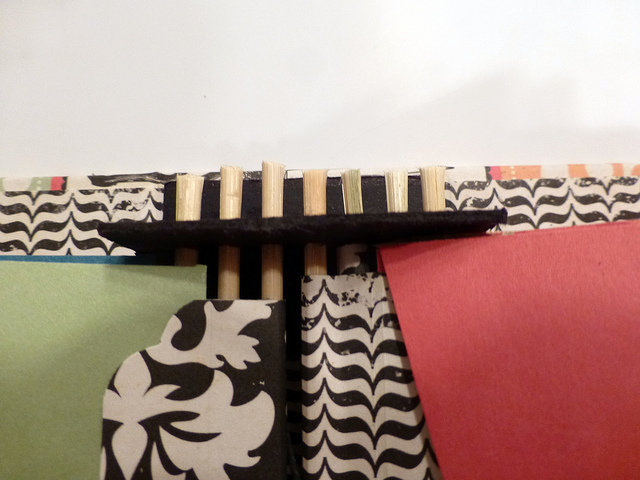 The black pattern for the binding is fabulous against the colors. Have a great day. Loved the show last night! Thanks for the measurements... can't wait to get working on mine. (Still need to collect a few supplies... seems you never have enough of something! LOL!) I hope you have a fabulous day! Fun show!!! Really like the project and will give it a go after I get home. Cesar did a super job, too! Thanks to both of you for a great evening!!! Wow Jim, i found this totally amazing. 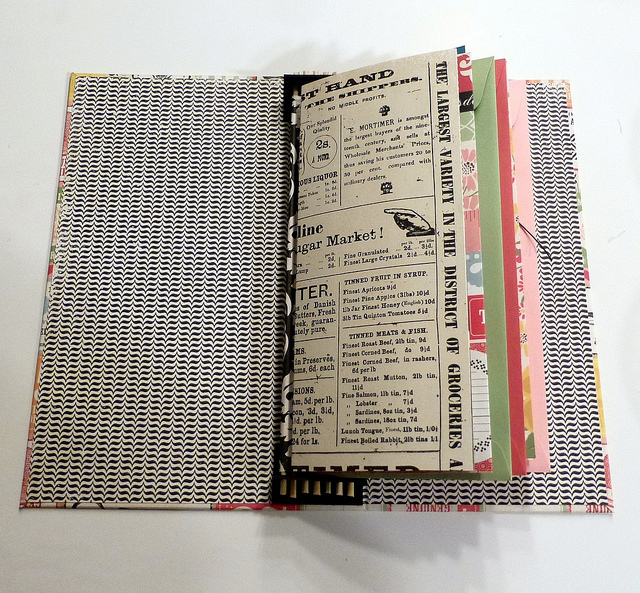 i have made skewered books before but the skewers were on the outside, well they had slits cut where you put through the paper. i love this approach you did.. but i liked the other one also bc i wound ribbons and embellies around and through the sticks and dangled charms, etc.. thanks so much for sharing with us.. love it!! Thank you for the measurements to a great idea - of course! Enjoyed your chatting while you crafted! Enjoyed your show last night. Remembered the time difference this time. LOL. So glad to see this binding as it is the one you used in the lighthouse right. You are awesome for putting together that tutorial Jim. I just can't wait to do that one and already have a place reserved for it on my fireplace hearth. I know we have already made so many demands on your time as it is, but I hope you are planning in the future to do a tutorial on that awesome eiffel tower you did for CHA. I have been gathering supplies for that as well, just incase. Just say'in!!!!!! I even have a spot in my head reserved for it as well. Another great u-stream. Thanks so much Jim and Cesar for taking time out of your busy schedule for us, please know that we appreciate you both so much. 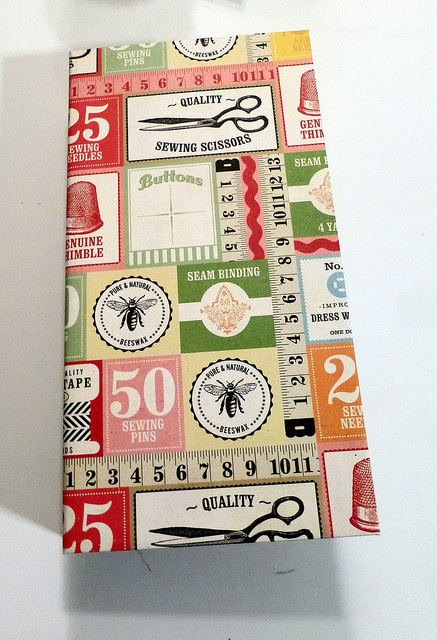 You made this binding look so easy, I can't wait to try it. It was great that your Mama made a guest appearance, she's such a sweet lady! Jim, don't stress over getting projects ready for Tues. nights, I'm afraid this is going to stress you out. We just like to hang out with you and watch and learn from you, hopefully you'll have fun too. i can´t wait to try it, too. Thanks, Gentleman Jim! Been waiting for this! Watched the video--great fun! Just remember--an artist isn't someone who makes no mistakes; an artist is someone who knows what to do with mistakes! And you, my friend, are truly an artist! I can't get the darned vid to play beyond 11 minutes. Please tell me you're going to give us a tutorial? that would be awesome with Asian theme papers or a BBQ album or all those pics by the fire pit. 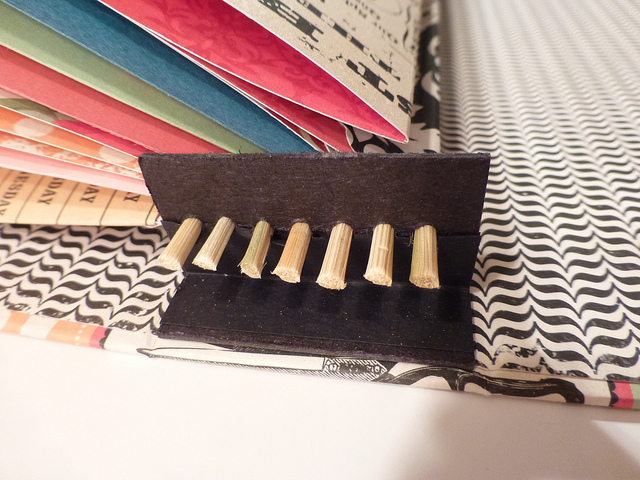 Loved your skewer binding mini! Can't wait to make one. Between you , Kathy Files, Kathryn, and Laura I need more time in a day. You all have such a gift for creativity and I love all of your projects. Please, Please, Please make a tutorial for your mom's card box. I loved it and hope you will share the directions with all of us. Thanks for your talents and your "what you see is what you get" attitude! Tell Momma she did a great job! like that. The album is really neat. I'll go back to the recording to make one just to learn how to make the binding.You know, if you don't really have the time to do a project, it would be great just to learn a technique or two. I would love to see how you cover something in metal foil for instance or how to work with wire. I know your time is limited and it's important that you keep enough hours open so you can just craft.Boy, can Cesar knit!Pretty cool. Thanks to you both. I had to watch the video, couldn't get upstream on my ipad will have to try the desktop. I love the skewer album but mostly just enjoy you. You make me laugh especially when you left to get the recipe. Are you going to post it? Thanks for sharing your life, am amazed at how you work full time, craft, travel, and always so up and energetic.. You're a gem.